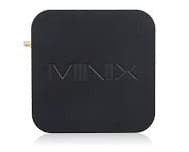 Minix Neo U1 Review – Is It Worth a Buy? In this modern day and age, there are a number of different ways to get the entertainment you want. One of the most popular methods is to buy a media hub that would bring all of your entertainment services into one location. 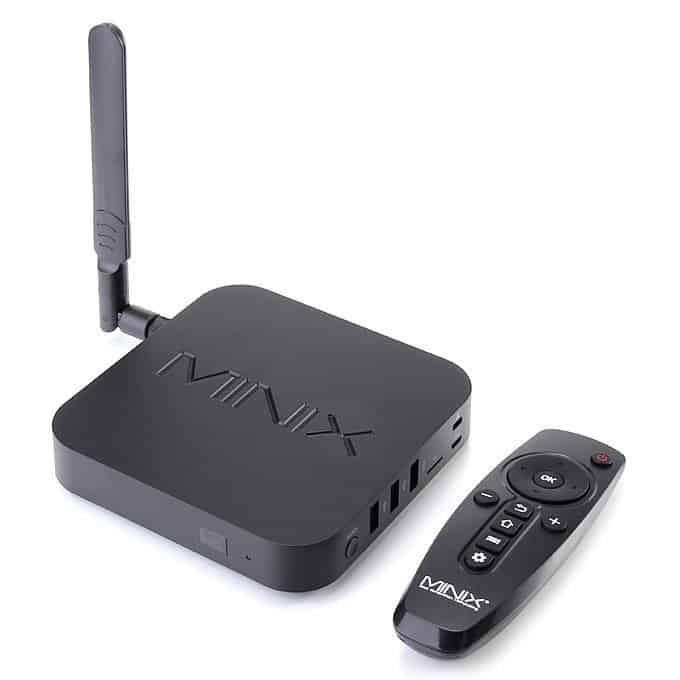 The Minix Neo U1 is a highly popular product that is meant to be an all-purpose entertainment hub capable of optimizing your downtime and allowing you to watch what you want when you want to. 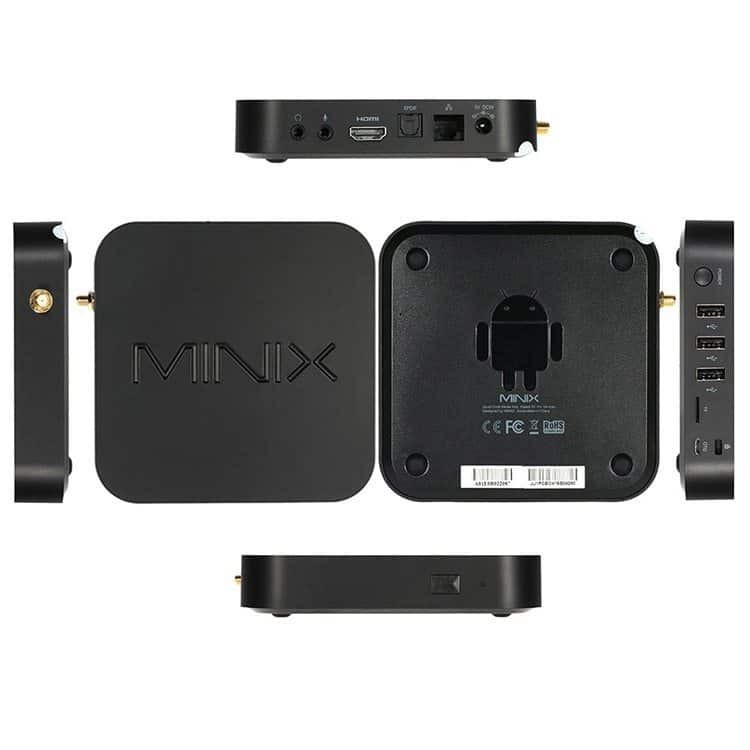 The Minix Neo U1 provides high-quality playback. This product is capable of showing you your favorite movies and TV shows in Ultra HD quality. The playback is so crystal clear that you would be hard-pressed to find a better alternative for watching high res videos. In spite of its 4K potential, this product also runs 1080p videos smoothly without the jerks and lags that you often have to endure with other products in the same category. The user interface of this product has been specially designed to ensure you do not have to worry about ease of use. The simple drag-and-drop menu takes minutes to learn, and adding movies and TV shows to your library can be accomplished at the push of a button. Learning curves can be a problem with many products in this category because the operating system is often changed to function on a TV, but this product’s interface has been customized for simplicity by eliminating a lot of flashy but unnecessary features. High definition is not everything; color matters a lot too. The color quality of this product’s video output is stellar because it shows said colors exactly as they have been shot in the original production. A lot of products out there favor a particular spectrum of color, so the balance you are getting with this media hub is very commendable indeed. One thing you are going to notice while using this product is how silent it is. Many media hubs make a lot of noise while they are running, which can take away from the overall movie watching experience, but thanks to the superior engineering of this product, you would not have to turn up the volume higher than needed in order to mask any incessant mechanical hums or whirs. Apart from providing you with a high-resolution display and true-to-life colors, this product supports 60 fps video output as well. 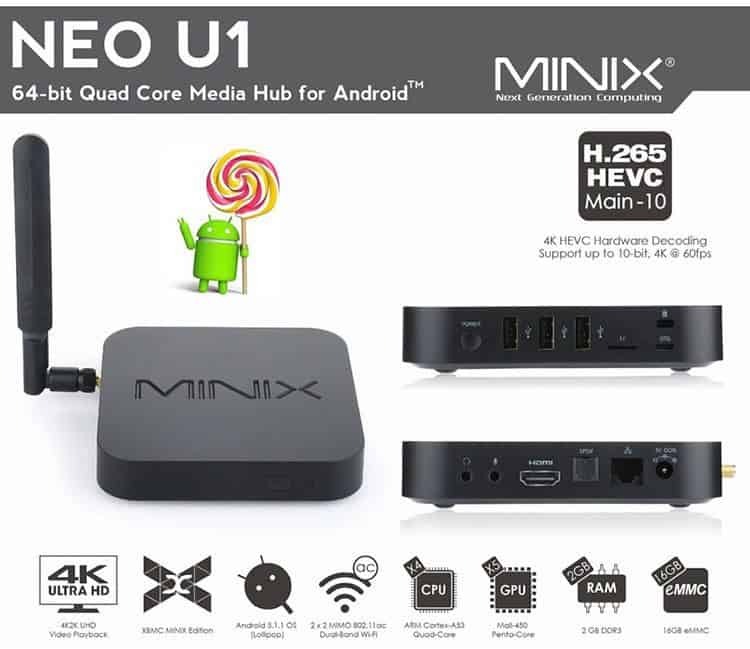 Many films are being shot in this frame rate format, so the Minix Neo U1 truly does provide you with a unique experience, unlike anything you would have seen before. The fact that this Android TV Box helps you make the most of movies and TV shows shot in this format certainly gives it bonus points. Audio quality matters too, and the audio output for this product is stellar because it gives you a truly cinematic viewing experience with surround sound. This makes this media hub a great option for music listeners as well. Every note will ring with clarity and both highs and lows will be audible with the same amount of clarity. The product is pretty energy efficient, automatically going into sleep mode if it is not used for an extended period of time. This can help you save on your electricity bill, which helps justify its expensive price to some degree. Thanks to the external antenna, the Wifi reception of the Neo U1 blows its competition with internal antennas out of the water. You won’t find a better performing Android Box if wireless connectivity is important to you. One of the most enduring benefits of purchasing this product is the fact that it is so stylish. The matte plastic exterior does not look cheap at all and can, in fact, boost the aesthetic appeal of your home. While you would generally not consider a media hub’s aesthetic qualities, this is a product that you can incorporate into the design theme of the room you place it in. Style points are unique to this product in the world of media hubs; most products in this category are sorely lacking in this department. This product is rather prone to overheating. Extended use is one of the most important aspects of a media hub since binging is an intrinsic part of movie and show watching culture these days. With this product, extended use can result in overheating, which could end up damaging the product. While the product will be fixed free of charge thanks to the warranty, it would be rather inconvenient not to have access to your media hub just because you binged a show. Overall durability is rather low as well. If you live in a home with kids, your things would be prone to breaking, so a lack of durability can pose a serious problem for you. If you drop this media hub or if it bumps into something, the chances of it breaking are quite high, so you would have to use it while keeping this in mind. One thing you might not like is the overall price of this product. It is rather expensive when you compare it to other media hubs on the market. The lack of durability is something you are going to have to endure which you might not like, considering that you are paying an above-average price here. The hardware for this product is pretty simple when you consider the functionality it provides. A matte black plastic casing encloses a quad core Cortex processor that is capable of handling even the most demanding tasks. The product also has 2 GB RAM which is more than enough to ensure smooth performance as well as 16 gigabytes of internal storage. This internal storage is useful if you want to store any videos in the media hub itself for later use so that you do not have to hook up your laptop or phone to the device every time you want to watch something. Apart from these specs, the product has a Wi-Fi card built in that offers a consistent and powerful internet connectivity. The Wi-Fi card is actually quite a nice touch because it can help you stream videos directly, which can be useful if you want to watch something without having to download and store it beforehand. When you take into account the decent internal storage space as well, you would realize that you can download quite a few shows directly into the media hub. This can help you turn this product into your all-purpose entertainment tool, allowing you to put aside your laptop and phone in favor of something a little more stable. The main video output is provided via an HDMI port. You also have two USB ports as well as headphone jacks in case you want to watch something late at night while everyone else is sleeping. While the presence of the Ethernet port is not going to make much of a difference for most people, if you want to hook up your media hub to the internet directly instead of connecting it to Wi-Fi, you can do so with ease. This can actually help you get a stronger overall signal since other people would not be able to share this connection with the media hub, thus ensuring maximum download speeds. As for audio, you have a standard 3.5 mm out that transfers quality audio to any speakers that you might connect. The product obviously does not come with built-in speakers, but the wiring of the audio port is absolutely top notch and will certainly help you boost your movie watching experience since everything is going to sound completely crisp and clear. Overall, the hardware for this product is solid, and the durability issues mentioned above are the only problems you are going to have here. While the hardware for this product is stellar, software is another matter entirely. Android Lollipop is two iterations old, so down the road, you might not be able to use some of the latest app updates which can be irksome since you might be used to them. However, Android Lollipop is pretty much the standard OS of any Android TV Box out there. That being said, the software for this product supports pretty much every video and audio file type out there, even lossless formats such as FLAC. Of course, you will have access to all apps on the Google Play Store. 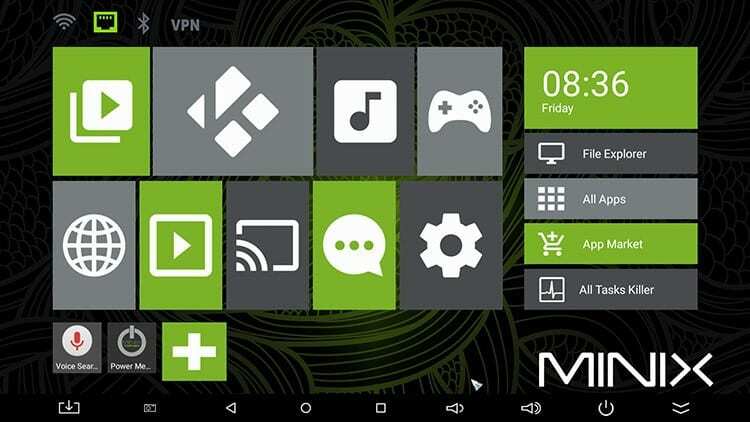 This allows you to install Netflix, Kodi or any other multimedia apps. Thanks to its beefy specs, the Neo U1 will have no problems playing the latest games on the app market. If big TV gaming is your thing, be sure to check out compatible game controllers to get the best experience. Whilst Kodi is a popular streaming app, the hunt for the latest add-ons can be bothersome. Luckily, there are products that automate this process (e.g. BlazeKey). However, if you buy the Neo U1 with the intention of replacing your cable subscription, Kodi will likely not make you happy. The best live TV and VOD experience is without a doubt provided by premium IPTV services, many of which can run on top of Kodi or have their own dedicated apps. Whatever problems you might have with durability and overheating, you are not going to have a single complaint about the overall performance of this product. To start off with, playback is going to be phenomenal. You are not going to notice even the faintest hint of lag and to top it all off, you will also get high-resolution playback in real time. This can help you live stream sports events and the like directly from your media hub, which is a huge bonus that you are certainly going to appreciate. Another area where the performance of this product truly stands out is gaming. While this is by no means a gaming console, it is certainly great for certain games that you might enjoy playing on your smartphone. The lack of lag and overall stellar video response means that you can play your favorite games on a bigger screen, thus ensuring that you get an incomparable experience that you will thoroughly enjoy. Performance-wise, there is little, if anything, that can be criticized about this product. The reviews for this product have leaned towards the positive side. While complaints about durability and the overheating problem abound, people generally seem to enjoy the all-encompassing entertainment experience that this media hub provides. It should be noted that even though the outdated operating system is a negative, most people don’t really care. Entertainment works fine on Android Lollipop and since you are probably not going to be using this product for social media browsing or smartphone gaming, the only real problem that people tend to have is with durability. One common complaint that people have made is about the price point, but the general consensus is that this is a product that is more or less worth the price it is offered at. It is certainly not a budget option, but then again, it was never meant to be one. Rather, it was meant to provide you with quality, and that always comes at a higher price. 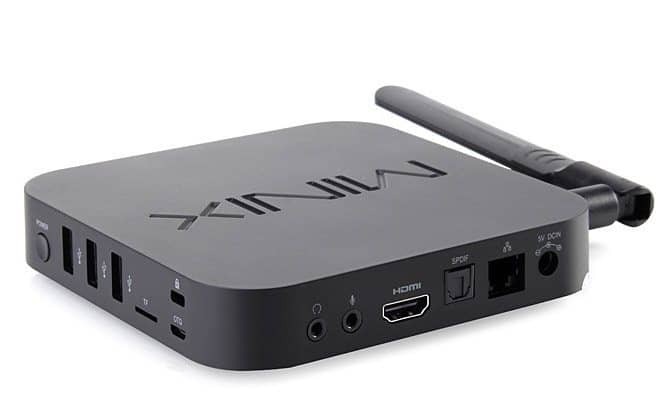 Overall, this is the sort of product that would give you some high-quality entertainment if you are willing to settle for premium Android TV Box. It is important to note that the durability issues are not that big a deal for people who don’t intend to move around this product a whole lot, and the sleek design gives this media hub an aesthetic edge that is hard to ignore. 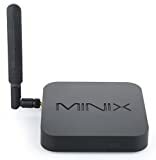 Essentially, the pros manage to outweigh the cons, making the Minix Neo U1 a product that would definitely make you feel like you have gotten something worth your money.